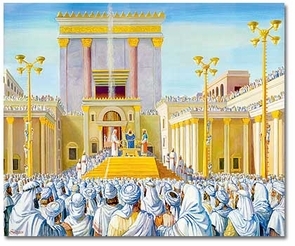 A poster of the First Temple of Jerusalem, also know as the King Solomon Temple. the poster shows the inner courtyard of the Temple: brazen sea, copper lavers, Altar, entrance to the Sanctuary. It was a religious focal point worship, religious ritual, Pilgrimage and sacrifices known as the korbanot. The Holy Temple was built in the 10th century BCE and existed until 586 BCE, whilst it was destroyed by the Babylonians. The Temple was built by King Solomon, son of the great King David and turned Jerusalem into the major city of the land for its time. Historically, it is believed that the Temple was situated where the the presetn day Dome of the Rock is. As glorious and magnificent as the Temple was, its most important room, the Holy of Holies, had almost no furniture at all. It housed the two tablets of the Ten Commandments (Which eventually disappeared when the Babylonians destroyed the Temple).